Unlike most fashion trends that go in and out of style, animal print seems to be one that has stayed for the longest. It is no more reserved for the elite, but has now emerged as an every woman's closet staple. Not in abundance, but at least one clothing piece, jacket, scarf, top or shoes to name a few, in this print is sure to be found in every fashion savvy female's closet . It is one of those pick-me-up pieces, that can go from desk to dinner in no time. Think of animal print as a classic neutral and pair it with bright solids,like orange, reds and greens. Limit your print to one single kind and use that to your advantage. It is an eye-catching print, so be wise in choosing the part of your body to don with this print. If you know your legs are your strong point then use this print to play your best feature. If animal print is not your thing, take baby steps with accessories like animal print shoes, or a dainty clutch in feline prints. With the endless options out there, you are sure to find something that works best for you. 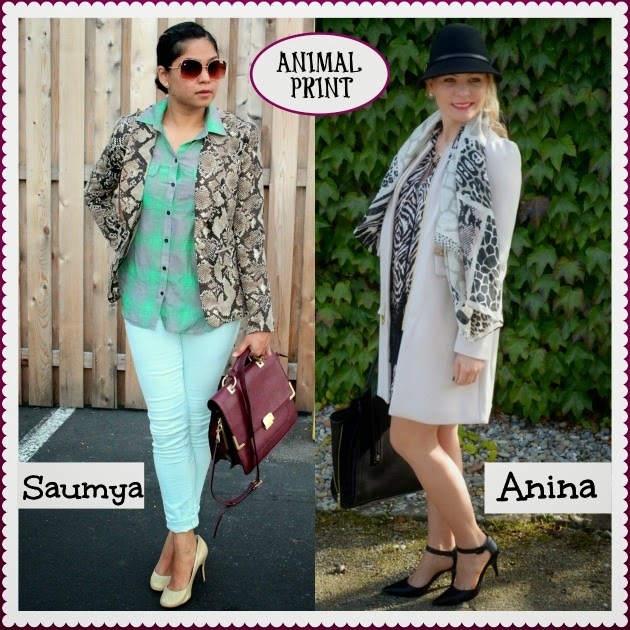 Today Anina from Fleurani and I have partnered together to show you dual ways of wearing this bold print. Feeling experimental, wear a python print jacket ( the 'IT' fall print ) over a monochromatic outfit, like me. Take cues from Anina's look for a more office appropriate look. Wear an animal print dress in a more conservative color ( B&W ) under a structured blazer/coat. Finish off the look with a cute scarf and a classy pair of kitten heels. Need more outfit ideas ?? Check this post, I did on the blog recently. Hope you enjoyed today's edition ! Have a great day and thanks for stopping by.